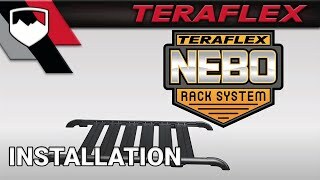 The purpose-built TeraFlex JKU 4-Door Nebo Roof Rack 6-Piece Cargo Slat Kit adds even more utility and versatility to our Nebo Roof Rack Main Rail Kit. This cargo slat kit incorporates OEM aesthetics and styling with rugged performance to increase cargo carrying capacity for your adventures. The low-profile streamlined design has been tuned to reduce air resistance and noise when unloaded. The 6-Piece Cargo Slat Kit provides a platform to hold gear and allows direct mounting of popular sport equipment carriers without requiring the use of a load or cross bar. This cargo slat kit must be used with the JKU 4-Door Nebo Roof Rack Main Rail Kit. The roof rack main rail kit (# 4722010 or # 4722000) features universal accessory mounting capability. • Total weight added including the main rail kit is 29 lbs. 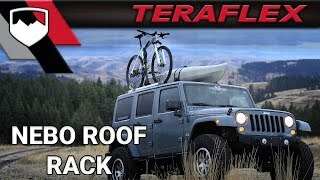 • Requires JKU 4-Door Nebo Roof Rack Main Rail Kit (# 4722010 or # 4722000). • JKU 4-Door Nebo Roof Rack Main Rail Kit requires drilling into factory hardtop. • 6-Piece Cargo Slat Kit also available in silver (# 4722050).